Over the past 27 years Steele's Carpets have fitted carpets in all the districts of Stockport, from Reddish to Woodford and from Cheadle to Compstall. Although we pride ourselves on being a local carpet retailer we've also carpeted houses as far apart as Anglesey to Whitby and from Newcastle to Crawley! 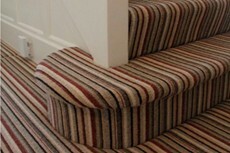 Steele's Carpets aim is to make your purchase as smooth and hassle-free experience as possible. From your initial visit to our Showroom to the day of installation Steele's Carpets will keep you updated with your order and endeavour to do everything around you busy schedule. When you visit Steele's Carpets with a view to buying a new carpet, vinyl or laminate our first task is to try to point you in the right direction for the right product for you. Factors taken into account will be the area being fitted - lounge, hall, bedroom etc, style of carpet preferred - patterned or plain. Number of people in the house etc.